A lower than usual distribution raise had Wall Street a little worried last quarter. 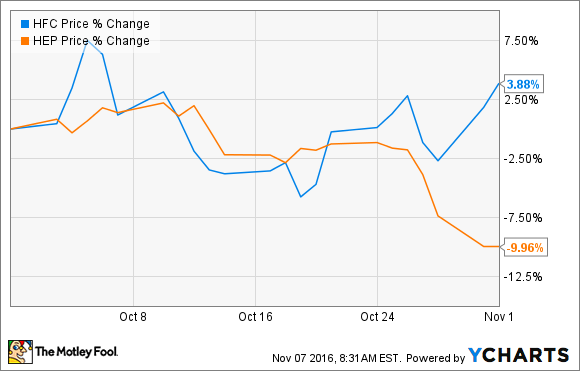 Shares of Holly Energy Partners (NYSE:HEP) slid 10% in October. The biggest culprit for the decline was the announcement of the company's distribution on Oct. 21 where the quarterly dividend increased by only $0.01 per share, a level much lower than expected if the partnership hopes to meet its distribution goals for the year. Holly Energy Partners has been saying to its investors all year that it expects to grow its annual distribution by 8% annually. This quarter's increase of $0.01 per share sequentially, puts the company a little behind that rate. Hence, investors were a little disappointed by the announcement. Part of the reason that its distribution raise was a little lighter than prior ones is because the partnership was in the middle of acquiring assets from its parent company HollyFrontier (NYSE:HFC), which was dropping down some assets from the Woods Cross facility for about $275 million. Holly Energy Partners issued debt and had to pay interest on that debt in the quarter, but it didn't officially receive the dropdown until later in the quarter, so there was a little bit of a cash flow discrepancy. Management believes that once the assets from Woods Cross are online for an entire quarter, it will be able to make up for that lost cash flow and be back on track for its typical distribution growth. Based on what management had to say about the dropdown and the distirbution as of late, it seems as though this is a very temporary issue that shouldn't impact the company too much long term. The one real concern is that Holly energy Partners is starting to receive refining assets from HollyFrontier rather than its typical pipeline and logistics assets. HollyFrontier has contracted these assets on tolling agreements that ensure no commodity exposure like its other assets, but this is uncharted territory for the company. It will be worth watching over the next several quarters to see if there are any adverse effects from owning refining assets to its financial statements.